The 600-year-old Kurşunluhan Inn in Kastamonu province in Turkey's western Black Sea region hosted a food contest with an aim to promote local cuisine, media reports said Tuesday. Some 12 competitors participated in the contest with meals particular to the region, including a food made out of the special 'siriçke dough', ekşili pilav (hibiscusrice with vine leaves and stinging nettle), yaprak sarması (stuffed grape leaves), simit tiridi (a dish made with Turkish bagels or stale bread), keşkek (a dish of mutton or chicken and coarsely ground wheat), black soup, mantar mıhlaması (sauteed mushrooms with eggs, onions, tomatoes and peppers) and mantı (ravioli-like dish served with yoghurt). 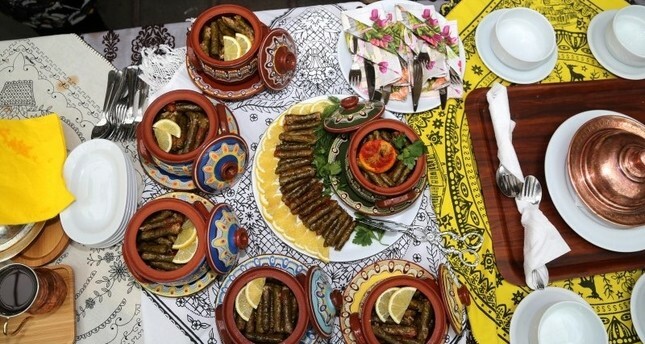 Nebahat Gümüş won the competition with her black soup made from black cabbage while Meliha Serhoşoğlu came in second place with her "kuşkonmaz mıhlaması" (an asparagus dish) and Nihal Yağız third with her stuffed vine leaves. Speaking at the event, Kastamonu Governor Yaşar Karadeniz said gastronomy was an inseparable and important part of the city, adding that they will hold more events to promote local cuisine while boosting gastronomy tourism in the city. Cem Dilimel, manager of the Kurşunluhan Inn, said that they were very happy to bring together the centuries-old flavors of Kastamonu in a place which has 600 years of history. The historic building is one of the most important historical structures in the region and was built in 1443 by the uncle of Ottoman Sultan Mehmed the Conqueror, Kemalettin Ismail, and has been serving as an inn for the travelers ever since. The inn was originally built as a part of the Islamic social complex, or kulliye, named after Kemalettin Ismail. Karadeniz Hotel Management rented the building from the General Directorate for Foundations in 2004 and undertook restoration works. Following a renovation, the inn opened its doors to travelers and tourists in 2008.